This node modifies the first terrain before it is inserted into a second terrain. This node is quite similar to the Full composition node, except that its role is to modify a terrain and not to compose it with another one. Like the Full composition node, this node also has multiplying coefficients: one to manage the height of the input terrain and another to manage the area outside the terrain after rescaling the terrain or increasing the terrain size. 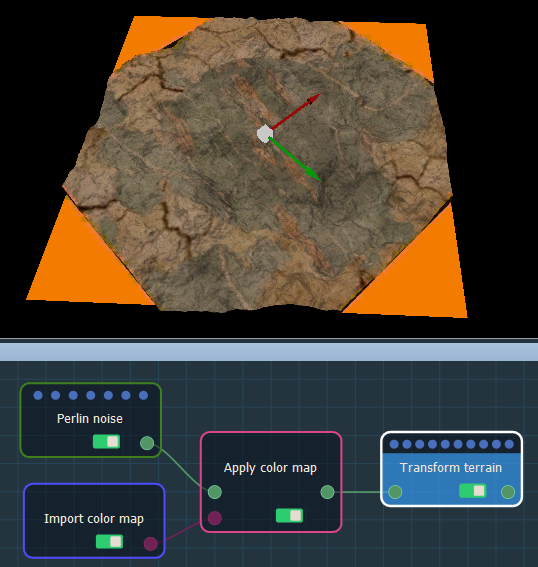 To add a Transform terrain node, right click in the Graph Editor and select Create Node > Terrain Transformation > Transform terrain. Terrain size: Sets the Width, Height, and Quad size of the terrain. 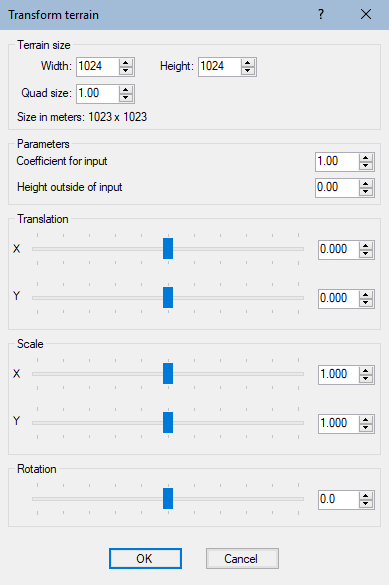 Coefficient for the input terrain: Sets the coefficient by which the height of the input terrain is multiplied. Height outside of the input: Sets the height of the output terrain vertices around the input terrain if the output terrain is larger than the input terrain. 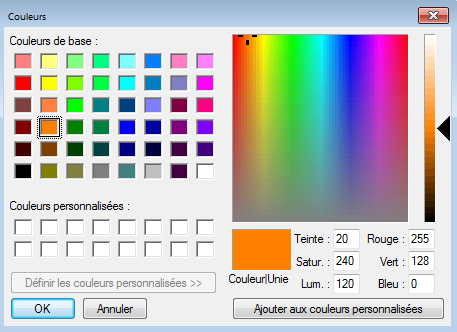 Color outside input: When the input terrain is linked to a color map, this parameter is displayed; otherwise, it is hidden. You can then translate, scale, and rotate the terrain. When the transformed terrain does not completely fill the output terrain, the empty space is filled with the selected color. If the input terrain has a color map, the color map of the output terrain also adjusts with the terrain transformation. 0 sets the center of the input terrain to the center of the output terrain. -1 sets the center of the input terrain to the left border of the output terrain. 1 sets the center of the input terrain to the right border of the output terrain. Scale X and Y: Scales the input terrain along the X and Y axis. Rotation: Rotates the input terrain around its center from 0 to 180 degrees.